Close to Seoul Sta. & Namdaemun! Opened in Dec. 2012. Hotel Manu is the brand new hotel which opened in Dec. 2012. 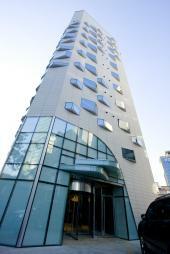 The hotel is located within a walking distance from Seoul Station where you can access various local cities, and Namdaemun, the shopping heart. There are Lotte Mart (Seoul Station Branch) and 7 Luck Casino (Millennium Seoul Hilton Branch) near hotel so you can fully enjoy your stay in Korea. The interior and lighting convey the impression of meticulous taste. There are stylish warm colored sofa and table in the lobby, offering a relaxing time while watching people pass by. Hotel Manu promises you a fascinating stay.